Ancient Polynesians used the sun, stars, and ocean swells to navigate the Pacific, the largest ocean on Earth with nearly half the world's marine waters. From west to east, they explored and settled a significant portion of the Pacific. Known as the Polynesian Triangle, this enormous swath of ocean has Hawaii at its northern point, while Easter Island and New Zealand mark its eastern and western boundaries, respectively. Pacific Island communities remain deeply connected to the ocean and uniquely attuned to the need to protect it. 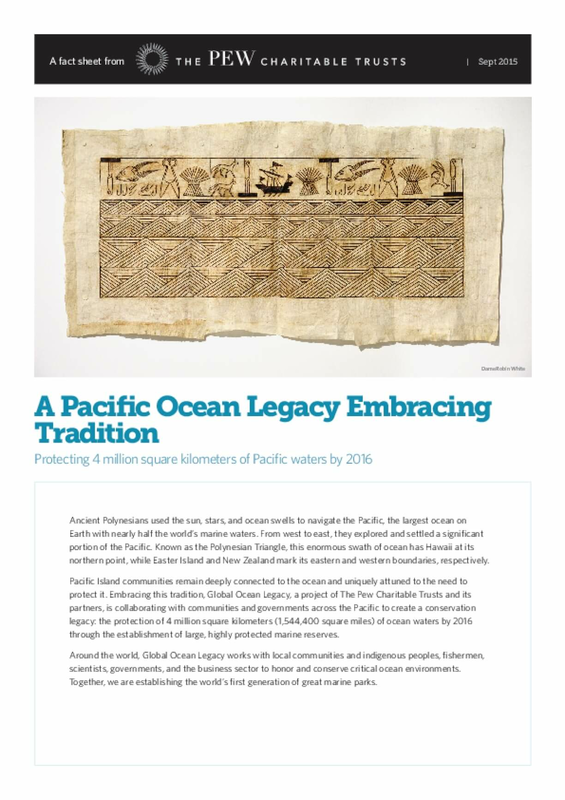 Embracing this tradition, Global Ocean Legacy, a project of The Pew Charitable Trusts and its partners, is collaborating with communities and governments across the Pacific to create a conservation legacy: the protection of 4 million square kilometers (1,544,400 square miles) of ocean waters by 2016 through the establishment of large, highly protected marine reserves. Around the world, Global Ocean Legacy works with local communities and indigenous peoples, fishermen, scientists, governments, and the business sector to honor and conserve critical ocean environments. Together, we are establishing the world's first generation of great marine parks.